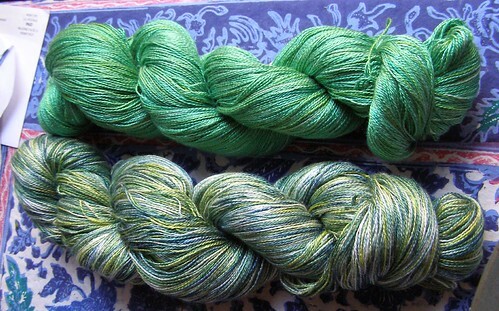 here are my first attempts at dyeing silk for the shop. we named them cosyColors which goes well with Cosy Knits (literally) and cosySpins. Flo came up with that. they’re 1666 yards – HUGE skeins of lace weight. one semi solid and the others variegated, but not the same all the way through, so your yarn will keep the same colorway, but change as you go. they wouldn’t pool if you paid them :) plus i spent forever jumbling them all up so that they looked decent. anyone know how to jumble more efficiently? so much to figure out. yesterday i tagged them and they’re out for sale! we’ll see what happens. 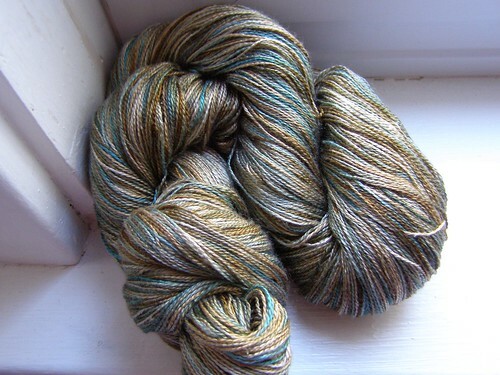 so that’s the expensive, lush, luxury fiber – and what am i a sucker for instead? 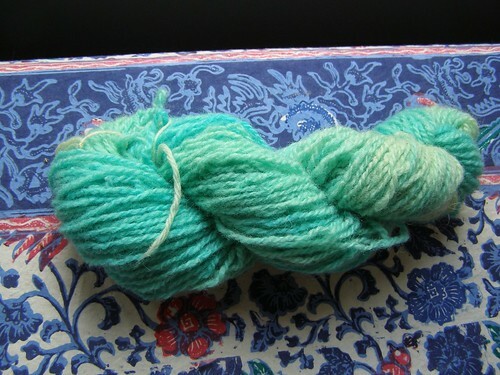 the leftovers ;) i exhausted the brown and the green dye baths with some of the recycled shetland from this post. i *love* them. they went into the dye bath unsoaked and then i added a bit more color and let the whole thing heat until exhausted. my fingers are itching to knit with these, but i’ve other things to get done today. hopefully soon. less yarn, more knitting coming soon! 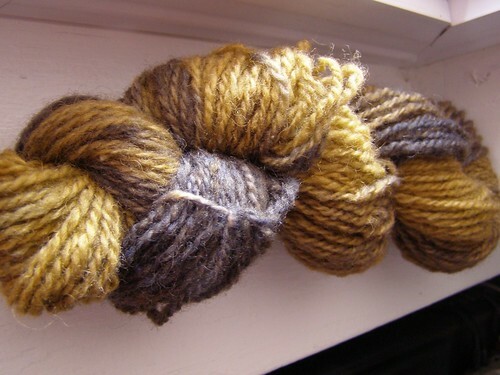 This entry was posted in dyeing, knitting, yarn by cosymakes. Bookmark the permalink. That variegated silk is just stunning. It has the prettiest sheen, which really works well with your color choices. I really want to sniff it, is that weird? I think that this is awesome & you do great work! The color of the silk is just beautiful. Maybe Mick and I can take turns sniffing! I wanna hug ’em too! Been lurking here for aaages and had to comment on those luscious greens. The silk especially is gorgeous. Good golly but that silk is divine. How are you doing that silk? It’s very different looking than your usual skeins. the yarns are absolutely gorgeous!